Jorge Luis Borges the writer from Buenos Aires, Argentina was an award winning writer and among the most critically acclaimed writers of the 20th century. Awarded numerous honorary degrees from a number of English speaking educational institutions he published essays, short stories, and poetry. Among these accomplishments, his Collected Fictions is the English speaker's entrance guide to the mind, imagination, and spirit of this author. Read more about A Review of Jorge Luis Borges' "Collected Fictions"
For those interested in reading the German philosopher and higher education professor Friedrich Nietzsche's ideas can see that there are large numbers of his books available in a wide variety of formats. 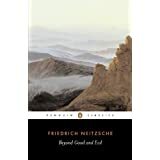 Read more about A Review of Friedrich Nietzsche's "Beyond Good And Evil"